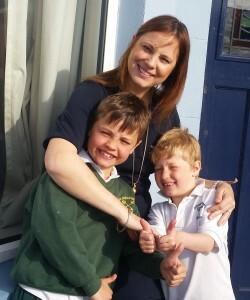 Kinnegar mum Clea Driscoll with sons Bobby (7) and Tom (5) . The noise used to waken the boys when they were younger. Public inquiry starts scrutinising proposals which could seriously affect 18,000 residents. Residents affected by aircraft noise from George Best Belfast City Airport have described the airport’s plans to potentially treble the number of jet flights from the terminal as “intolerable”. Under the plans, which are to be considered at a public inquiry which gets underway in Belfast this morning [10am, Monday 18th May], the airport’s own figures show that the annual number of jet flights could treble from the current level of 14,000 to 43,000 if the proposals are implemented, significantly altering the current mix of aircraft types operating at the terminal. The airport’s own figures reveal that up to 18,000 residents could be affected at a noise level which the UK government says causes significant annoyance; the projected impact is far higher than the noise footprint of major airports such as Gatwick and Stansted, where around 3,700 and 1,900 people respectively are affected at the same level. “We have robust evidence that many residents and their children already suffer disrupted sleep, higher stress and poorer quality of life, due to existing levels of aircraft noise. One family whose lives have already been badly affected by aircraft noise are the Driscoll family who live in Kinnegar. Clea and John Driscoll and their sons, Tom (5) and Bobby (7) live in an enviable location close to Belfast Lough. But the pretty exterior of their blue-painted house belies a grim fact; their home is right under the flight path. “When we first moved here, more than 10 years ago, the planes weren’t such an issue,” recalls Clea. “But things soon got worse and, when our sons were small, the noise really disrupted their sleep. “Now, we’ve swapped bedrooms with them, and it’s my husband and me who get woken up. “I’ve lived in my house for 40 years, before the airport even started, and the noise just seems to get worse and worse,” she said. “Although I’m retired, there’s no chance of a lie-in, because the planes start at 6.30 in the morning. “You can’t escape from the constant drone of the planes; my health has definitely suffered and I find it very hard to relax properly in my own home. “The noise is so bad that I sometimes have to suspend sessions with my clients until a plane has passed – that’s very disruptive for my clients, some with significant mental health problems, and makes it difficult for me to provide the quality of care I would like to. “And my young grandchildren can find the noise of the planes quite frightening; they often come to stay with me, but the noise disrupts their sleep which then in turn affects their mood and ability to concentrate the next day. A total of 1,308 objections were received by the Department of the Environment after the airport’s application was first made in 2012. The public inquiry which is examining the airport’s proposals is being held by the Planning Appeals Commission at Park House, Great Victoria Street in Belfast. The Commission has produced a timetable which envisages four days of hearings from Monday 18th May to Thursday, 21st May. Belfast City Airport Watch will be giving evidence on Wednesday, 20th May. Among the witnesses which it will be calling is a renowned expert on the health impact of aircraft noise, Professor Eberhard Greiser, who has acted as lead investigator for a number of studies examining the links between environmental noise and public health, commissioned by the German Federal Environmental Agency. He has reviewed the likely effects of the airport’s proposals on health and children’s education. There is a reason why all these restrictions have been put in place at Belfast City Airport and if anything they should be revised downwards. In time this airport has gradually outgrown its original purpose. You just can’t justitfy sacrificing the wellbeing of a whole city because of the greed of a private company. We have a perfect airport at the International – it is within easy reach of Belfast and the whole Province and with none of the issues at the City.The flight paths of planes going to and from Belfast City affect most of the city and the city centre not just East Belfast!!! Could we please see some common sense for a change from our politicians and relevant authorities?!? Honestly, what does it take to see the obvious? Other may not have much a choice in their air infrastructure but we are in the fortunate situation of having a choice – one good and one bad! Please don’t ruin our city by turning it into one big landing strip. Could everyone not happy with the developments at Belfast City please show your disapproval and boycott it by avoiding to fly from there. We already do that. They have a perfectly good alternative airport out in the country at Belfast International, Aldergrove. It used to be used by, among other services, the British Airways London Shuttle. There is no need to expand City Airport.